This week marks the end of my first month in Thinking Notes. So much has happened already! Today, I will share about my experiences and key takeaways during this one month. It was really fruitful and I have really learnt a lot. And oh boy was it such a rollercoaster ride! Just to warn you, there is a huge wall of text up ahead! There is only one word to describe this experience: impressive. From my extremely limited knowledge of internships, most interns are designated as errand runners and coffee fetchers for their supervisors. They are also handed fluff work which has no actual bearing on the company to complete. 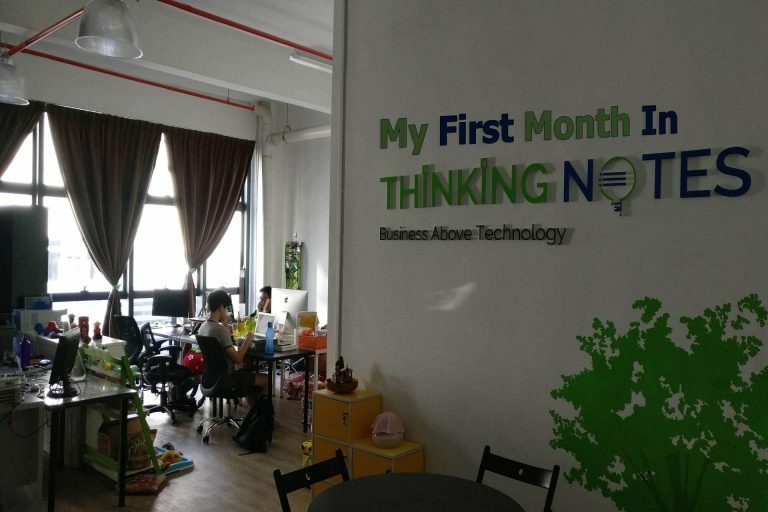 From my stay in Thinking Notes so far, Ken has assigned both Ruey Xuan and me several live client SEO projects to work on, as well as reviewing the statistics of the websites weekly together with us to provide ample feedback for the next steps. The reviews serve as a compass to point us towards the right direction. Without it, we wouldn’t know what went right and what went wrong. Ken also encourages us to take up ownership of the projects, meaning to spur us on to come up with new initiatives and ideas that could possibly help the website achieve even further organic growth. By taking up ownership of projects, it encourages you to take pride and be passionate in your work, which grows your character and at the same time, let the website reap the fruits of your labour. Random artifact of great significance. As SEO involves multidisciplinary work, two of the most important soft skills I have acquired here are the understanding and application of psychological and key marketing principles. I shall elaborate on each in detail here. For the psychological aspect, we learnt about psychology of the buyer’s journey, which was made popular by Hubspot, a well-known inbound marketing company in the online business community. The buyer’s journey is customer-centric, meaning that the strategies implemented are made with consideration to the welfare of the customer. It is mainly summarised into three crucial components: awareness, consideration and decision phases. Basically, for each phase, the psychological thought flow of the customer is different. Thus, the approaches towards customers in each phase ought to be different. This further substantiates the idea that a using a cookie-cutter build to attract customers will not work well at all. For instance, it may be effective when applied to customers in the consideration phase, but makes the customer in the decision phase change his mind. A pertinent example can be a well-written copy by a customised hammock company on how customised hammocks are cheap and ideal for many people, but the company writing the copy sells one of the most expensive customised hammocks in the market. Understanding the psychology of customers is both an art and a science in SEO. One of the key marketing principles I have learnt is to insert a call-to-action near the end of my posts that target consideration and decision phases. Sometimes, customers don’t know what to do on your webpage until you prompt them with suggested actions. So there you have it, just some of the soft skills I have learnt! Fuel of Thinking Notes. I present to you, “The Pantry”. These are strictly functional skills I have learnt over here at Thinking Notes. As it has earlier been discussed, one of the technical skills I have learnt is the optimisation of the meta-description tags. Another one is to understand the different functions of a page versus a post. A page will generally consist of evergreen content that forms the cornerstone of the website, while posts are designed to flesh out customer-centric content that lead customers down the conversion funnel. How do we achieve that? Well, we will have to create a buyer’s persona through cold, hard research. I have also learnt a little bit of design skills, such as to optimise an image to load fast on a webpage while maintaining high fidelity. For structured data, I have learnt that canonical tags are added to content to attribute the website the article was originally published at. These are just among some of the technical aspects of SEO that I have learnt. Adding on to that, every week I learn new things about WordPress and plugins that I didn’t knew existed! WordPress is actually a really versatile content management system for how much it costs: zero! Furthermore, after a month of constant practice, I am now able to publish perfectly optimised pieces of stand-alone content, even if the content was to be published on social media! I am glad to say that I have really learnt quite a lot the past month, and am very satisfied with it. Just to prevent misunderstandings, when I say laid-back, it does not equate to low-quality and minimal effort placed in projects! What I mean by a laid-back culture is that the office practises a flat structure, free of hierarchy. This makes it extremely efficient and easy to clarify doubts and seek help when it is needed. When proper communication is made so easy, it makes things much more efficient and induces less stress. So now do you see why I said that the culture was laid-back rather than slack? In any case, Ken performs the role of a mentor very well, as he tries to let us understand the underlying fundamental reasons of why we do some things a certain way. He implores us to not just do things blindly as no learning outcome would result from it. Sometimes, he would banter with the guys from Fortiedge, a company specialising in web security solutions, which is entertaining and takes the stress off of us, as Ruey Xuan has mentioned in the chronicle of his stay here. Choppie: I wonder what’s inside that bag…must be for me! How can I ever forget about the mascot of the office? Choppie is practically the face of Thinking Notes, as she is just so prominent! She is a Pembroke Welsh Corgi, as she does not possess a tail. Playing tug-o-war using a rope as well as tossing her the rubber ball can be very entertaining and helps to relieve a lot of tension whilst being seated at the same spot for many hours. It helps me to unwind momentarily for a short break, before returning invigorated to engage a task again. We have recently found out that she doesn’t like loud sounds and the snapping of fingers. Last but not least, to harbour a growth mindset. I guess I have revealed it partially when I was discussing about working on live client projects, near the end of the paragraph. As we continually work on different facets that influence the ranking of a website, we are able to grow alongside it. Having a growth mindset is important as it propels you to continually challenge your upper limits. What results from this is that you emerge a more capable person, with certain skills and techniques more or less being permanently integrated into your core being. And this process is not just a singular occurrence. It can occur repeatedly, resulting in the emergence of a pretty skilled individual. This is especially important in the field of SEO as search engines tweak their algorithms regularly, and what happens is that the “conditions of a win” are constantly being altered. These are just some of my experiences and take aways after being in Thinking Notes for one month. It is just crystallised in the form of a heavily condensed summary. Of course, there are many other things that I have learnt and experienced, but those are best saved for another time. For the best representation, one needs to experience it! Have fun, enjoy yourself, and then do your best. Only then will you unleash your true potential.